Graham McCormack [3(0)-0] showed just why people are all to keen to jump on board the G-Train with how he reacted to Jordan Latimer’s recent troubles. The Limerick light middleweight and the Sligo puncher looked set for a feisty grudge match having shared heated verbal sparring sessions online over the last few months. It all seemed to set up a mouthwatering December 7th clash and the pair had agreed to settle their differences in the ring on Ray Moylette’s Homecoming show at the Royal Theatre. However, Latimer’s career hit a serious pothole after his now-infamous quickfire defeat to Matchroom prospect John Docherty last month. Indeed, the 20-year-old is now undergoing licencing issues and admits that he subsequently fell into a depression. Rather than fume that his chance to sample the all-Irish fight feel was now gone, McCormack showed serious compassion and reached out to help a fighter – he was intent on knocking out – to get back on his feet. The Eddie Hyland-trained boxer revealed he knows what dark places look like so he got in touch with the young Manchester-based fighter and Latimer [2(0)-1(1)] subsequently revealed the help was crucial. “I saw all the stick he was getting online after the Docherty fight and I saw one of his replies and he seemed really down so I mailed him,” McCormack told Irish-Boxing.com. It’s another reason to like a fighter that has really added something to the pro scene which he joined later than most. McCormack is one of those infectious ‘delighted to be here’ members of the pro circuit and one who is in entertaining fights and is always quick with a good line. Now it seems he is one of many genuine nice guys in the game too – although he does admit he would have enjoyed inflicting pain on Latimer if the pair had met. 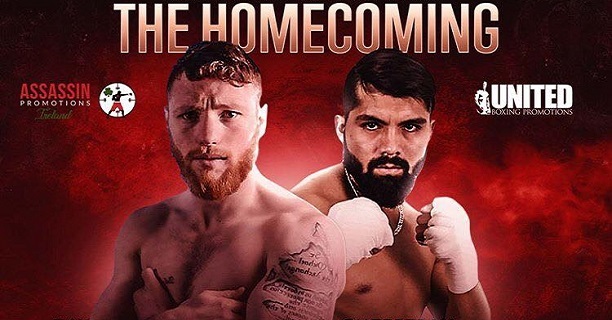 While the chance of a somewhat high profile all-Irish clash is no more, McCormack has secured the next best thing as he fights Jade Karam on a show that includes Spike O’Sullivan and the Limerick-based Luis Garcia. Not quite Irish, but South African Karam lives and trains out of Cork and makes up for what he lacks in technical skills with come-forward aggression and ambition. In that regard he is a step up from journeyman opposition and someone who could test the Limerick native in his first six rounder. It’s an answer to McCormack’s step up calls, a fight he is excited about, but an opponent he knows has the potential to do damage. McCormack also revealed he will have to put friendship to one side to secure victory. “I have respect for Jade, he is a nice guy and we speak regularly,” revealed the 31-year-old. While it’s a step up in rounds and level of opponent for the Stephen Sharpe-managed fighter, it also appears to be a step up in terms of the card. The fight will be part of a Royal Theatre Castlebar show which may be broadcast on TV and features some big names. It’s something of an upgrade from the small hall which is something that hasn’t gone unnoticed by the self-confessed boxing fanatic.